So simple and so stunning. 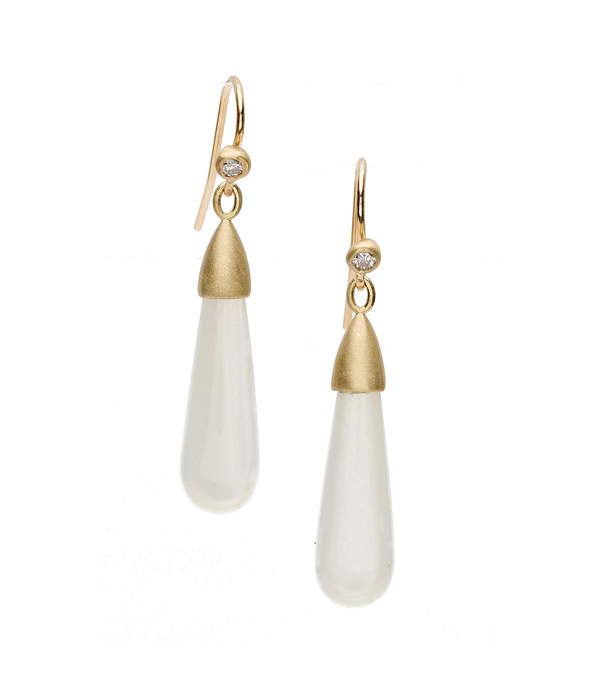 An elongated moonstone bead hangs from hand-shaped earwires accented with diamond set pods. Moonstone has been used in jewelry for millennia. Both the Romans and the Greeks associated moonstone with their Lunar Gods. The Romans believed it manifested from moonlight and that you could see an image of the Moon Goddess Diana in the stone. The Greeks called it Aphroselene by merging the names of their Goddess of Love, Aphrodite and their Goddess of the Moon, Selene. All stars align when you embrace you inner moon goddess with these radiant earrings! Categories: Earrings, For the Bridesmaids, Regency.